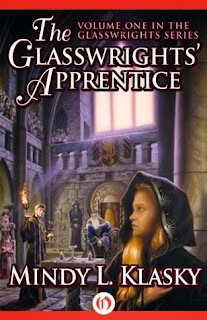 Rani Trader was born a merchant, but now she is an apprentice in the prestigious Glasswrights' Guild. When Rani witnesses the murder of the Crown Prince, she's accused of being the killer.On the run and labeled a traitor, Rani must travel the city streets, masquerading through her kingdom's strict castes as she attempts to discover the actual assassin. Along the way, Rani meets true friends and false leaders. She discovers a secret brotherhood, and she must determine who is her greatest ally... and who is her most bitter enemy. "Mind your caste," Rani is told. But what good will that do, if her caste gets her killed before she can expose the Prince's actual murderer? I was really intrigued with this novel. I read the description of this one and bought the entire series at once because I was like oh my this sounds so interesting. But it took me a couple days to get through this one and then I wasn't sure I wanted to continue with the rest of the series. It is an interesting enough concept and there was some action in the novel, but a lot of the plot dragged for a long time before anything too exciting happened after the first whirlwind of adventure. Rani herself seemed like a naive character. She was constantly just following orders and didn't seem to have a real thought of her own. Anything anyone told her became her absolute Truth without question, even if it was completely opposite of what she believed just prior to this interaction. I think a lot of this came from the fact that she was young, so hopefully she starts to grow into being her own person and character in the rest of the series. I am excited to see how Hal and Rani interact in the next novels and Mair seems like she could be the best character in the series. I am hoping that there is more adventure and action in the next one because a lot of Rani's scenes were boring and I was not a fan of her two week stint of working at the one booth. I found that to be filler to the novel and not really necessary for moving the plot or helping Rani's character grow. Overall: 3/5 stars. Interesting book with an interesting concept. Some of the descriptions of the different tasks that Rani had to do were not interesting. I am hoping that in the next books there is some more world building to keep my interest.